In a bit of a bait-and-switch, Sherlock revealed very quickly at the start of this episode that Jamie Moriarty was not involved in the web of conspiracy around the assassination attempt on Morland Holmes. Her organization, however, was. 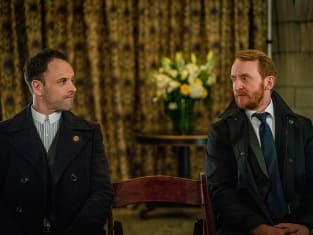 In Elementary Season 4 Episode 23, our intrepid detective was faced with the fallout of his failure to fully dismantle her extensive criminal enterprises after her arrest several seasons before. The face of the organization was now Joshua Vikner, played by the excellent Tony Curran. 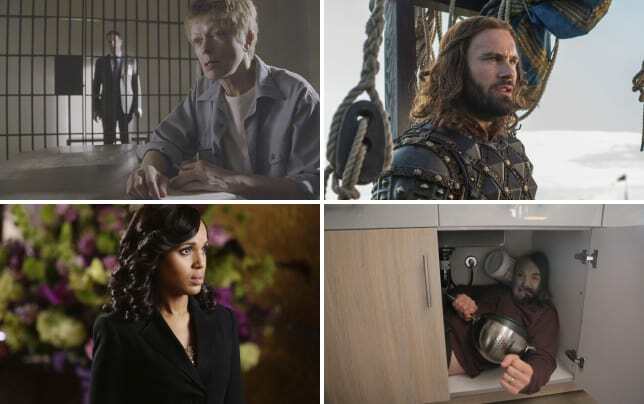 The good Mr. Curran has a long and remarkably diverse resume, including Daredevil, Defiance, Sons of Anarchy, Hawaii Five-0, Doctor Who and many more. I truly enjoyed Vikner's repartee with Sherlock; something tells me, though, that he probably won't survive the season finale. Well, he was fun while he lasted! There was a good deal of eyerolling on my part when perpetual professional Eastern European Villain Pasha Lychnikoff popped up as Ruslan Krasnov, the shooter responsible for the death of Morland's girlfriend Sabine. His death was pretty much inevitable, though his multilingual sparring with Sherlock in the interrogation room was pretty entertaining. It also gave Krasnov a little bit of depth as a character: he's not just a guy who's good at building bombs and killing people, he's apparently quite well-read. John Noble got downright ruthless in the confrontation between Morland and Sherlock, where Morland placed the blame for Sabine's death at Sherlock's feet, since Sherlock failed to follow up on dismantling Moriarty's organization after her arrest. So the last major remaining question rests in the motive for the attempt on Morland Holmes's life, which resulted in Sabine's death. As Sherlock pointed out to Vikner, it made no sense on paper. Despite Vikner's protestations, it was not all about business. Therefore, it the motive was certainly personal in nature. I think my early theory that Sherlock's (clearly not actually dead) mother is behind all this mess is getting stronger than ever! This theory provides a strong motive in the death of Sabine, too: bitterness and jealousy. And if she's even half as clever as Sherlock is, than she'd have no problem pulling the strings of a world-wide criminal organization! Plus, it would make a perfect recipe for DRAMA! One last question, though: if Sherlock and Joan were supposed to be off-limits to Moriarty's people, why did they come back to a bomb in their brownstone? Did Vikner decide to countermand Moriarty's orders, or is the bomb a dummy, perhaps some sort of warning? Vikner was the father of Jamie Moriarty's child, as Sherlock noted. Surprisingly (or perhaps not), Krasnov was correct in his statement that Russia does not have an extradition treaty with the United States. As far as I know, though, that doesn't prevent the U.S. from, say, kicking him out of the country because he obviously entered illegally! Sherlock and Joan may have been off-limits, per Moriarty's orders, but it didn't seem to occur to them that everyone they know and love was not covered by this. Check out our Elementary quotes page for some of the notable lines from this episode. So, what did you think of "The Invisible Hand"? Are you excited for the season finale? What was the real motive for the attempt on Morland Holmes's life? Let us know what you think in the comments section below! If you missed this episode, you can watch Elementary online to catch up before the season finale airs next week! 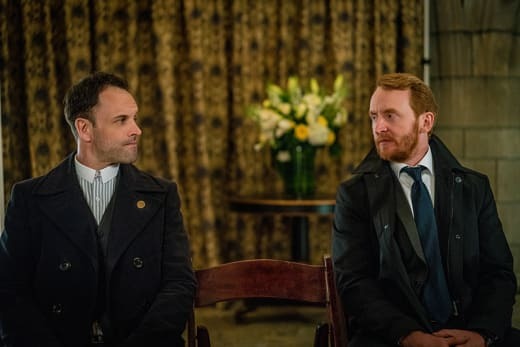 Elementary Season 4 Episode 24, "A Difference in Kind," is slated to air on Sunday, May 8, 2016 at 10/9c on CBS. Until then!